The wood duck is a favorite of birders, as the waterfowl has a unique and strikingly beautiful appearance. A male wood duck is especially distinctive, with a crested head and coloration that includes purple, green, blue, red, white and black; females exhibit more dull colors but an equally fascinating profile. Building a wood duck box encourages predictable nesting for easy observation of the animal during breeding season, when a wood duck is most beautiful. To understand the effectiveness of human-placed nesting boxes, it's helpful to know something about the fowl's nesting habits. While other birds are known for elaborate nesting habits, the wood duck doesn't concern herself with careful construction, using only wood chips and feathers to build a nest. Other ducks nest on the ground, but the wood duck nests in tree cavities that shelter her from predators. Hole size is variable, ranging from inches-wide woodpecker holes to larger apertures, as is depth, which can range from a couple of feet to the entire length of a tree. Constructed nesting boxes have a history interwoven with the species' own plight. Wood duck populations suffered a notable decline in the 19th century due to their popularity with hunters, but the Migratory Bird Treaty of 1918 offered birds protections that saved the species from total extinction. 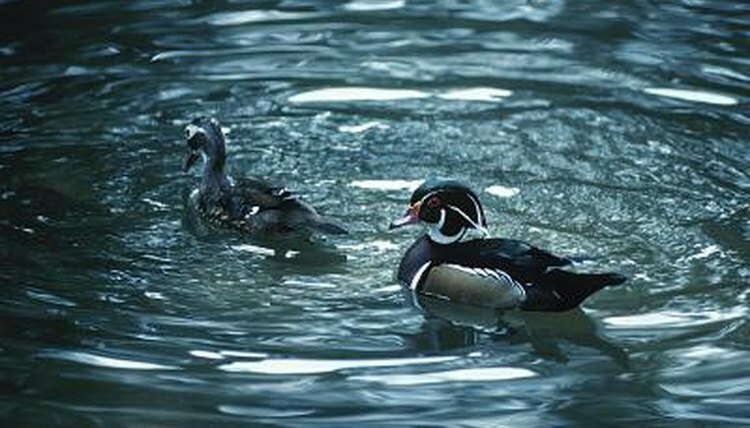 Wood duck survival was further assisted by the rise in popularity of nesting boxes in the 1930s and 1940s, as bird-watchers noted the duck took to artificial nesting stations with better success than other waterfowl. Wood duck boxes have undergone some changes during the decades -- early nesting boxes were made of wood, while contemporary models also are made of metal and plastic. Advantages and disadvantages exist for each material: Plastic and metal boxes resist rot and deterioration that wood is subject to, but are notoriously hot in warmer climates. Despite the lack of long-term durability, wood remains a popular material for wood boxes, both for its natural appearance in a wooded area and for its ease of use by hobby builders. As the wood duck isn't overly picky in the specifics of her nesting enclosure, a builder has more leeway in construction than do builders of other species of bird houses. One basic idea should guide construction: protection. As the wood duck is a common food source for carnivores such as snakes and raccoons, a box offering security is more likely to attract an occupant. Rough cut lumber is usually used to build a rectangular wooden box, 2 feet long and 1 foot deep, with a slanted, hinged top that allows both rainwater runoff and access. A 4-inch hole in the top third of the box's front piece will allow the duck easy access. Installation can be done either on a pole or a tree, with special attention needed to deter predators access: Eliminating overhanging limbs and branches will prevent access from above, while a conical predator guard installed below the nest thwarts access from below.